The past two weeks, there’s been a whole lot of Olympics-watching in my household. You too? I don’t know what it is about curling, I don’t even care who’s throwing the stones, I will watch it. (and GO Team USA-men on your gold medal!). The same goes for ice dancing (did you see those smokin’-hot Canadians?? Wow!) and figure skating. I honestly can’t tell the difference between a lutz, a toe loop, and a Salchow, but the fact that they nail the landing 9/10s of the time is just astonishing. It was while watching the fortnight highlight farewell review by the NBC Olympic Ice commentators – Scott Hamilton, Liam McHugh and Tanith White – that one of them said in closing how grateful they were to their off-camera research team for helping them be as informed and prepared as they were. That they couldn’t have done their job without them. There were enthusiastic nods and additional words of gratitude from the other two, which went on for a good half-minute or so. As they were talking I smiled, imagining the proud, swelled chests of those researchers hearing those accolades. I knew they were giving each other knowing looks and virtual high fives. It must have felt like winning their own Olympics gold medals, getting on-air acknowledgement and thanks from the front-of-the-house team. It was a great prelude to Prospect Research Pride Month, which starts today. (And FYI it isn’t limited to just prospect research; it’s also Prospect Management Pride Month and Fundraising Data Science Pride Month, too). Everything that falls under the umbrella of Fundraising Intelligence is celebrated this month. If you’re a frontline fundraiser working with a talented fundraising intelligence pro – or a team of them – this month is a great time to show them a little extra appreciation. In a nonprofit’s prospect management system, it’s the frontline fundraiser that gets the credit for bringing in a gift. 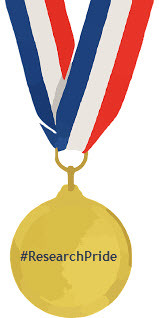 At the celebration party, the leader always awards the virtual medal to the gift officer. And not to take away a single gram of that gold, but fundraising success is a team effort. If you’re a frontline fundraiser, do what the Olympians do and let someone else hold the medal for a minute. Take a moment to share with the researcher (and/or their supervisor!) a specific example of how their work made a difference to your success. Or how their insight simply helped you think about that prospect in a new light. It’ll feel great, and it will be deeply appreciated. And for you fundraising intelligence professionals: the Apra chapter leaders are gathering in Chicago this month to talk about the year ahead, collaboration, and advocacy, so now is a good time for you to be in contact with your local chapter board members if there are things you’d like to see discussed at that meeting. How would you like to see your professional association improve? What is your chapter doing right? Let them know – I can tell you honestly that they really do want to hear from you! If they’re doing something right, show them a little love, too.